Hook Up to 4 Wireless Cameras to the HS1450! 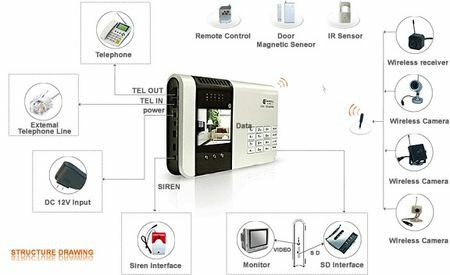 Global leading operation of wireless alarm and motion detection recording. Adopt 2.4G wireless transmission surveillance image signal. Up to 4 wireless cameras can be used indoor or outdoor. Support all around with multiple types of sensors including infrared sensor, door contact sensor, vibration sensor, and microwave sensor. 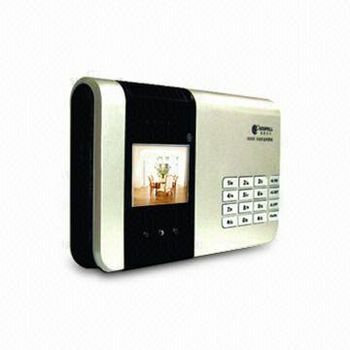 Arm/disarm via the main unit or arm/disarm and emergency alarm by remote control. Remote arm/disarm and listening function works with telephone set. Both Audible alarm and silent alarm. Six groups of preset telephone numbers for alarm, and automatic dialing of alarm call. Delayed arm and delayed alarm function. Simultaneous display of alarm signals of multiple zones. Highly intagraded embedded recording system. SD card, automatic overwriting, cyclic recording, featuring low cost, energy saving, and vibration prevention. Permanent saving of recording data and alarm setting data after a power failure. 2.8 inch TFT LCD display for recording playback, and supporting display by TV or computer monitor. Easy to install and use, featuring a true DIY home security system.